So far, Nintendo Labo VR hasn't wowed us over with its DIY approach to one of the hottest trends in gaming right now. Sure, it looks fun for a few minutes of cardboard mayhem but, compared to the likes of PlayStation VR and HTC Vive, it's child's play (literally... that's the point). But, in a strangely subdued announcement late last night, Nintendo announced that both Super Mario Odyssey and The Legend of Zelda: Breath of the Wild would be receiving full Nintendo Labo VR support, with the former even releasing three newly designed stages exclusively for the platform. Due to release as free updates on April 25, a few weeks after the release of the new Labo VR kit itself, Odyssey and Breath of the Wild's VR compatibility promises to let players "experience 2 beloved games in new ways with the Toy-Con VR Goggles." In the case of Breath of the Wild, the JPRG will be fully playable in VR with head-tracking, but you'll still be using the Switch's Joy-Cons to determine things like camera placement and the majority of in-game actions. Super Mario Odyssey, meanwhile, will receive three new "mini-missions" set in the Cap, Seaside, and Lunar Kingdoms players will remember from the main campaign, in which you'll be tasked with collecting music notes and coins for "a bitesize bonus experience in simple, family-friendly VR." Using the VR goggles, players will observe Mario from a third-person perspective, and be able to tilt their head to alter the camera's angles from above, but you'll still be using the regular Joy-Cons to control the plumber's in-game movements as usual. 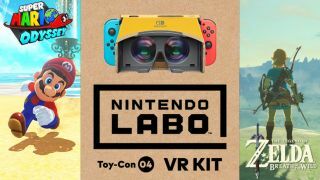 Nintendo has yet to confirm whether the games' respective VR modes will be receiving visual updates to ensure a smooth ocular experience when playing through the Labo goggles, as motion sickness is almost guaranteed from a virtual reality game that runs below 60 frames per second. You'll also need to hold the goggles up manually to your head to play with Nintendo's VR kit, which makes the concept of playing for more than 30 minutes or so unfeasible at best. We'll be sure to give Nintendo Labo VR a go when it releases on April 14 later this month, and will let you know our final thoughts on the full product once we've invested enough time into its mind-bending technical trickery. Watch the video below to see what we thought of Nintendo Labo VR at our recent preview, or find out more about the upcoming Switch games on the way for 2019 and beyond.